Two years into a presidency that continues to question America's global self-interests, debate continues over whether the United States should be the world's policeman, a sideline referee for world problems, or simply a self-interested bystander carrying a "big stick." 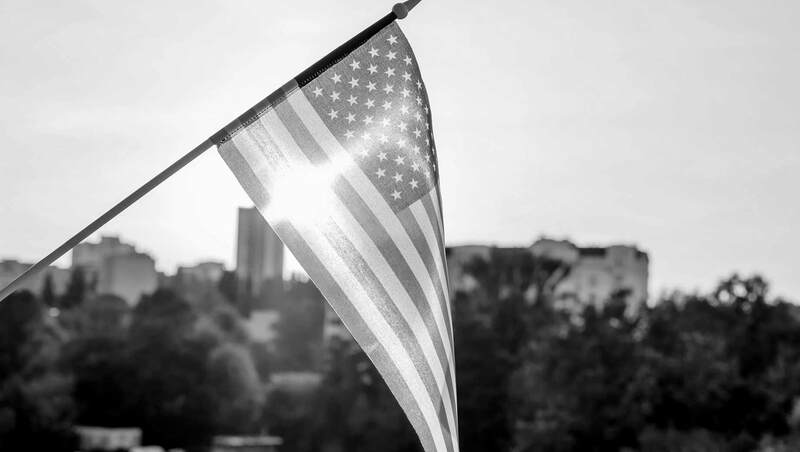 In a recent opinion article in the Wall Street Journal (March 5, 2019), Walter Mead argued that "There is no more important question in world politics than this: Will U.S. public opinion continue to support an active and strategically focused foreign policy?" 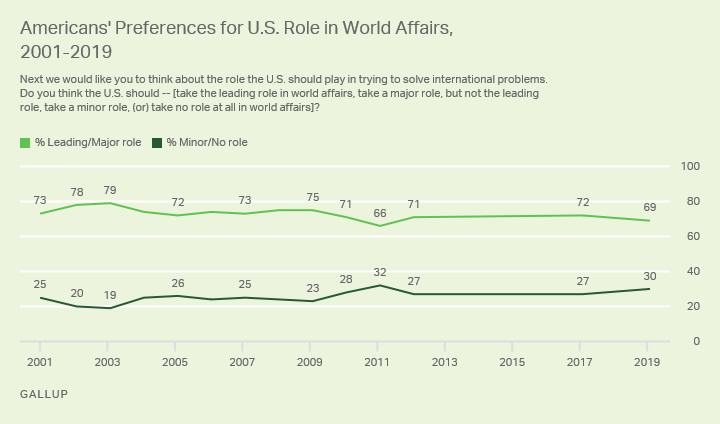 In February, Gallup updated a question it periodically asks about how Americans view U.S. involvement in the world: whether the U.S. should play a leading role in solving international problems or adopt a lower level of engagement or even non-engagement. Although almost 70% of Americans say the U.S. should still play a strong role in world affairs (23% say the leading role, 46% a major role), 30% prefer that the U.S. reject entanglements in foreign situations (25% favoring a minor role and 5% no role at all). Over the past three presidential administrations (of George W. Bush, Barack Obama and Donald Trump), Americans have shown a majority preference for the U.S. taking a leading or major role in world affairs. However, the percentage expressing isolationist tendencies, or at least indicating they prefer that the U.S. assume a lesser role, has increased from an average 23% during the post-9/11 years of the Bush presidency to 30% in 2019. A second question in the February 2019 survey probes whether Americans want more spending or less spending for defense or military purposes. Forty-three percent endorse the status quo, saying current military spending is "about right"; 29% say the U.S. government is spending "too much"; and 25% say "too little." When the 2017-2019 data from these two foreign policy questions are combined, five distinct groups emerge, with views ranging from "hawkish" sentiments for potential military intervention (21% of all Americans) to "dovish" noninvolvement and nonmilitary types (18%). Those in the Hawks group predictably identify mostly as politically conservative (62%) rather than liberal (13%). Hawks are also mostly Republican, with 71% identifying as Republicans or independents who lean toward the Republican Party and 25% as Democrats or Democratic leaners. The Doves group tilts the other way, in that 49% are Democrats or Democratic leaners, while 37% are Republicans or Republican leaners. The Doves are also more divided in their political beliefs, with 41% identifying as moderate, 32% as conservative and 24% as liberal. Beyond the two groups at either end of the spectrum, there is a greater range of strategic visions that show more complexity and reveal the degree of difficulty in arriving at a U.S. foreign policy consensus. The following table details the differing strategic vision groups that are much more complex than the Hawks and Doves, each of which can make or break a consensus in foreign policy decision-making. This group, which represents 27% of U.S. adults, advocates for stronger roles for the U.S. in achieving a world democratic order. This may include foreign interventions from the military or dispatching humanitarian aid. Those in this group also favor multilateral organizations like the United Nations, global free trade, and only episodic military engagements, like the Balkan War, the liberation of Kuwait, and, recently, intervention in the Syrian war. This doctrine is routinely associated with the pursuit of global stability and a status-quo position of bipartisan consensus. In terms of party identification, 44% are Republicans or GOP leaners and 52% are Democrats or Democratic leaners. Thirty-nine percent of this group describe themselves as politically moderate, 36% as conservative, and 24% as liberal. This group represents 21% of all Americans and supports a leading or major role for the U.S. by maintaining the current balance of power in the world but without more investment in the military. When viewing U.S. military spending, their doctrine holds that "more is not better, if less is enough." In short, they are against wasting money on "foolish foreign interventions." In terms of party identification, they are mostly Democratic (77% are Democrats or leaners), while 47% describe themselves as politically liberal, 34% as moderate and 19% as conservative. This group, sometimes called "America First Populists," represents the 9% of Americans who want a foreign policy that is mostly non-interventionist but desire a stronger U.S. defense. They have a predisposition that harkens back to the GOP isolationist posture of the 1930s, leading up to World War II. Those in this group reject foreign entanglements and have a strategic vision that the U.S. must be militarily superior to protect U.S. interests, probably so it can be focused more on its own problems rather than those of other countries. Sixty-five percent of those in this group are Republicans or Republican leaners and 27% are Democrats or Democratic leaners. They are overwhelmingly conservative (56%), while 29% are moderate and 12% are liberal. There is no longer a single, coherent, national strategic vision (if there ever was one) for how the U.S. should face the rest of the world. The traditional view that American leadership must see itself as the world leader for global stability is now challenged by some new isolationist tendencies, intense political party polarization and modifications of support for NATO and the United Nations, the two great pillars of institutional world order since World War II. The question of whether the U.S. should continue to maintain a physical military presence in countries like Syria, Afghanistan, and Iraq could factor into the 2020 presidential election. All told, it's clear that reaching public consensus on how the U.S. should operate in the world is a tall order and one that will have to navigate at least five existing fault lines. Read a second story on the topic of public opinion and U.S. engagement with the world. While fewer Americans now say North Korea is the United States' greatest enemy, 79% see the country's nuclear weapons development as a critical threat to U.S. security. Fifty-eight percent of Americans say the U.S. rates favorably in the world, up slightly from last year, and the highest figure Gallup has found since 2003. Americans hold the military in high regard, but with an already-increased defense budget, relatively few say the U.S. spends too little on the military.